Velositol is a unique chromium / amylopectin complex that increases muscle protein synthesis (MPS) when combined with protein and exercise. It is GRAS affirmed (generally recognized as safe) at the recommended serving of 2 grams per day in protein drinks (including ready-to-drink and powder), meal replacement bars, energy and protein bars, with the consideration that these products can be taken up to three times a day. Nutrition 21’s Velositol is finally making its way out there – and the research is too! Velositol is manufactured and sold by one of the most prominent supplement ingredient suppliers, Nutrition 21. You may know them from their other patented ingredients, Nitrosigine (a popular nitric oxide enhancing ingredient) and Chromax (a form of chromium supported by over 50 studies). Thanks to Nutrition 21’s extensive knowledge of chromium and its ability to assist insulin (often for purposes of glucose metabolism and weight management), the creation of Velositol for muscle-building purposes was a logical next step. Nutrition 21, the creators of Velositol, assisted with the scientific research in this article. This is a promising new ingredient, to say the least. There has been some highly-successful preliminary human research on Velositol (but with smaller protein doses), while newer animal-based research with higher doses of protein combined with the ingredient also proved successful, although to a lesser degree. In this article, we will cover this research and the mechanisms behind the ingredient, thanks to the help of Nutrition 21’s science team and the creators of Olympus Labs Superior Protein, creators of our favorite Velositol-based protein. What is Velositol? Watch our Interview with Todd Spear from Nutrition 21! What does Velositol do, and how? 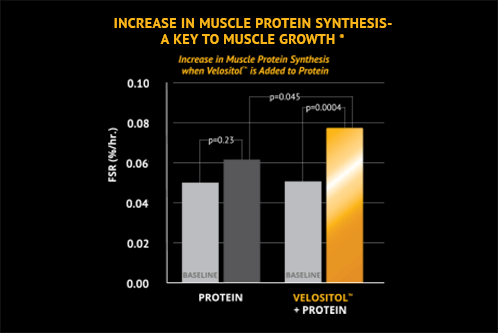 Velositol increases muscle protein synthesis (MPS) in combination with protein and exercise and it works by enhancing insulin sensitivity, resulting in greater uptake of amino acids into muscle, fueling MPS. Chromium Picolinate has a very interesting effect on rats. If we drive it with a part of a starch (amylopectin), can we take advantage of this?! Chromium picolinate, one of the main ingredients in Velositol, has been shown to improve insulin action, as well as increase the metabolism of nutrients. Increased insulin action causes various anabolic effects such as increases in the metabolism of nutrients (such as carbohydrates, lipids, and protein) and increases in the rate of glucose and amino acid uptake in muscle cells. Therefore, Velositol is thought to stimulate MPS via improved insulin activity. The pros seem to far outweigh the cons… so why not give it a try? Healthy insulin activity is vital for MPS because in the presence of a protein containing essential amino acids, insulin aids in the transportation of amino acids into muscle cells to stimulate MPS. Therefore, when combined with adequate sources of protein, Velositol can increase insulin action and in turn, stimulate MPS. Moreover, Velositol has been shown to significantly increase enzymes involved in the MPS signaling pathway (such as mTOR, S6K1, and 4E-BP1), providing evidence of the cellular pathway by which Velositol enhances MPS. Finally, an additional mechanism of action may be through increased myokines, such as musclin and fractalkine, which are cytokines released by muscle during exercise that lead to MPS and hypertrophy. Both clinical and preclinical studies have shown that groups taking Velositol had the greatest levels of myokines. Therefore, another mechanism by which Velositol increases muscle protein synthesis is through enhancement of the myokine signaling pathway. Clinical research shows Velositol effectively doubles the power of “suboptimal doses of protein” when the two are consumed together. We’re cautious when we see graphs like this, so keep reading for the larger doses. In a double-blind, crossover design, active-controlled trial, ten healthy subjects (6 men and 4 women) were given 6g of whey protein plus 2g of Velositol or 6g whey protein alone, after an overnight fast. 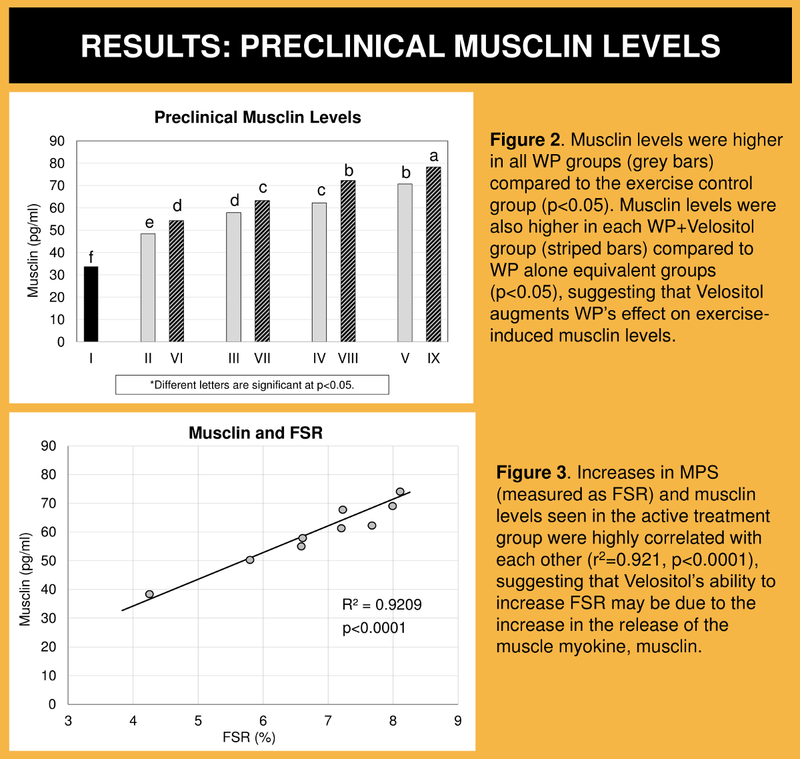 After a single dose and resistance exercise, MPS, as measured by the fractional rate of protein synthesis (FSR) in skeletal muscle, was significantly higher in the Velositol group (p < 0.05 between groups, which means this data beat the standard cutoff for statistical significance). Specifically, Velositol was shown to double the amount of MPS seen versus whey protein alone. Moreover, the study’s results showed that cytokine levels were highest in Velositol treated subjects. 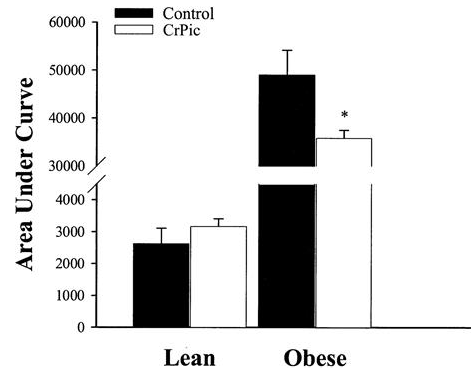 It’s important to note that this was with a “suboptimal” dose of protein, as the study is titled. While we often take more than 6g protein post workout, this was a great first-step pilot study, and BCAA/EAA doses are often near this 6g dose, so it’s not completely out of line. This chart is based upon a rat study, but uses more reasonable amounts of whey protein – and the results are more reasonable as well, but still great! In order to see if the above clinical findings could be applied to various forms of protein and increasing doses of protein, a preclinical study was carried out in which rats were dosed with escalating doses of whey protein (from 6g to 40g human equivalents), pea protein (6g human equivalent), or BCAA (6g human equivalent) with or without Velositol (2g human equivalent). 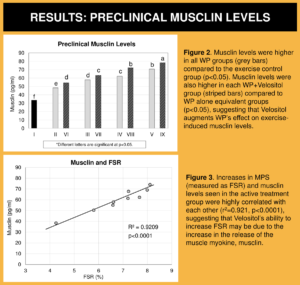 The study data showed that after treadmill exercise, the Velositol plus protein groups showed significantly greater MPS in muscle compared to the corresponding protein alone groups (p < 0.05 between groups). At the larger protein doses, MPS wasn’t double like it was in the 6g human study, but a significant increase was still there, and this could mean something very big for an athlete who’s going after every last drop of gains. Additionally, all groups supplemented with Velositol plus whey protein again had significantly higher musclin levels compared to whey protein alone groups (p < 0.05 between groups). The increases in musclin levels, seen in the Velositol plus whey protein treatment group, were significantly correlated (p < 0.0001) with increases in muscle protein synthesis (r2 = 0.921). Why do they say it works “in combination” with protein and exercise? Simply put, Velositol’s effects have only been tested in combination with protein after exercise, so those are the claims that can be made at this point. The reason they performed studies in this fashion is because it is easier to compare to these known use cases: we already know that both protein and exercise individually are known to increase MPS, so the best way to show that Velositol boosts the power of protein was to test it against those factors! So can Velositol help with general muscle maintenance when not training, ie. for older populations who have a harder time retaining muscle mass? Maybe, but this hasn’t been tested and claims cannot be made. Note that MPS still occurs on days following exercise, taking Velositol on post-workout rest days could still have beneficial effects on the MPS that is occurring during muscle recovery – there’s just no scientific proof here, so Nutrition 21 is wise in playing it safe with any such claims. For those who need more “real life” information, a clinical outcomes study is currently being designed to examine the effects of Velositol plus protein taken for two months on muscle growth, strength, and exercise performance in healthy subjects. We’re told this could be at some point in Q1-2019, so the best thing to do is sign up for PricePlow’s newsletter and subscribe to PricePlow’s YouTube channel, as we hope to have Nutrition 21’s researchers on our channel to explain this in person as well! Velositol is a GRAS ingredient (at the recommended 2g per day with protein) and has not been shown to have any reported adverse effects in any of the research studies or anecdotal use. Moreover, although chronically high protein intake (ie over 3.5g/kg body weight for long periods of time) can have detrimental effects on liver and kidney function at higher doses, Nutrition 21’s preclinical data has shown that Velositol does not negatively affect liver and kidney function, and even potentially promotes healthy liver function, as shown by decreased levels of enzymes, aspartate transaminase (AST) and alanine transaminase (ALT), which are common indicators of kidney and liver disease. Meanwhile, with chromium picolinate itself, a 2-year NTP toxicity study showed that it was safe in doses up to 50,000ppm (equivalent to a dose of 2,400 mg chromium picolinate per kilogram of bodyweight per day), showing that even at that extremely high dose for a long exposure time, “CrPic” was not toxic. What is PricePlow’s favorite product containing Velositol? Users looking to try Velositol in a protein powder have a couple of excellent options. If going for pure muscle-building and want some extra carbs (and thus great taste), Olympus Labs Superior Protein is where it’s at – cereal pieces inside and all! Superior Protein comes in a “Muscle-Building Edition” and a “regular” version, but both contain Velositol! Olympus Labs’ Superior Protein nailed it, Velositol and all! With this one, the cereal bits are for real! If looking to keep the carbs lower, then take a look at BN Labs Ultimate Whey Isolate, which is what we consider the “purist’s protein” in that it contains over 90% protein by weight — and that’s after including the Velositol, flavors, and thickeners! Graham cracker was our favorite flavor when Mike explaained it here (and also had a lively discussion about Velositol inside). Note that BN Labs is so intense about keeping their powder with over 90% protein by weight that they don’t have a chocolate flavor, because the cocoa would take up too much room! So if you’re a protein purist and want to give Velositol a go, this is about as clean as it comes! If using 2g Velositol, we are told that the manufacturer must add 2g carbohydrates to the label due to the amylopectin starch. 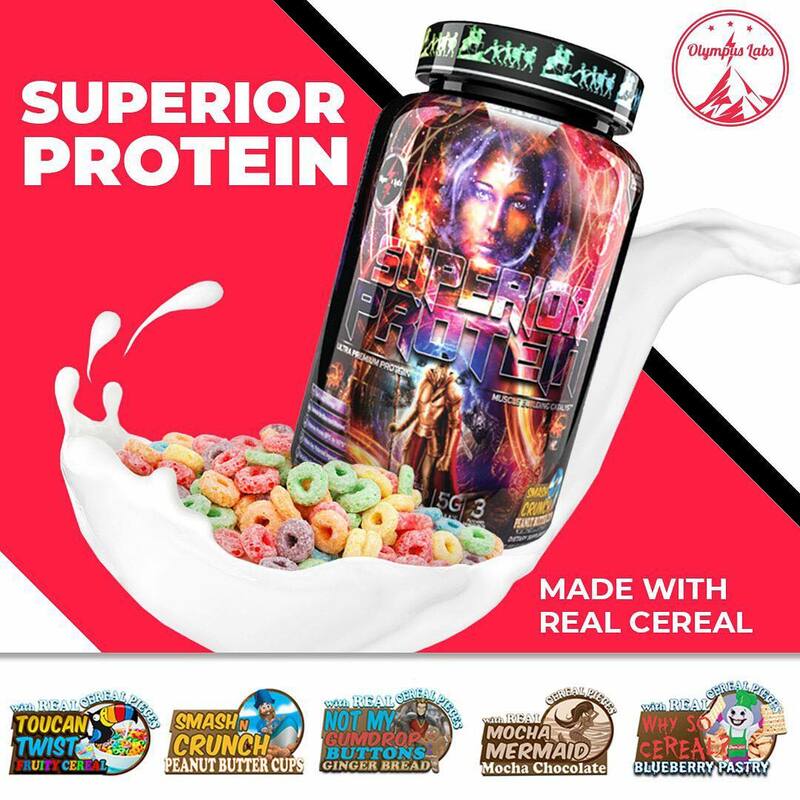 This is one reason why Olympus Labs Superior Protein is a bit higher in carbs (the other reason being that they include rice cereal in most flavors). It also leads us to believe that BN Labs is only using 1g Velositol in theirs to keep carbs low and protein-by-weight ratio high. It’s important to keep things in context and take a realistic look at Velositol. 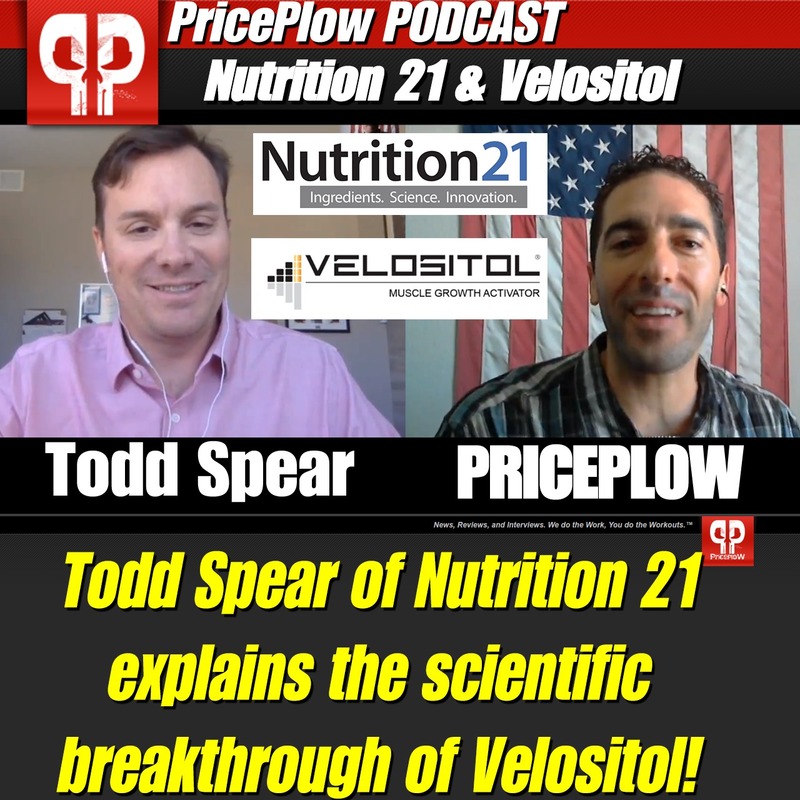 Don’t forget to watch Todd Spear of Nutrition 21 talk about Velositol on the PricePlow YouTube channel! When we first saw the “suboptimal protein dose” study showing 2x muscle protein synthesis rates, red flags begin waving. There’s obviously something cool happening there, but we’re typically not interested in what happens with 6g protein. With the exception of some hydrolyzed whey based intra workout supplements, we typically drink more than 6g whey protein at a time. However, the second research study, which was admittedly an animal one, seems more realistic. Some gains at reasonable protein doses, yet with data that doesn’t involve towering bar graphs. Reasonable gains from reasonably-increased insulin activity. So with that said, at this point, the pros seem to far outweigh the cons already, if you’re looking to gain that additional edge, we see no reason not to try a product with Velositol – especially if you’re dialed into your body’s response to food and training. There doesn’t seem to be an additional cost markup in these products, and that would have been our only real concern given that we’re already comfortable with chromium and amylopectin. Ultra-conservative users who need more human-based research may wish to wait until more in-depth studies, but for everyone else, we simply ask, why not? Comments | Posted in Supplement Ingredients, Supplement News | Tagged 4E-BP1, Alanine Transaminase, Amylopectin, Aspartate Transaminase, BN Labs, Chromium, Chromium Picolinate, Cytokines, Fractalkine, Glucose Transporters, Insulin, mTOR Pathway, Muscle Protein Synthesis, Musclin, Myokine, Nutrition 21, Olympus Labs, Protein, Protein Powder, S6K1, Velositol, Whey Protein.